Brian Azzarello has been writing comics professionally since the mid-1990s. He is the writer and cocreator with Eduardo Risso of the acclaimed Vertigo series 100 BULLETS. Azzarello's other writing credits for DC Comics include BATMAN and JONNY DOUBLE (both with Risso), SUPERMAN: FOR TOMORROW (with artist Jim Lee), and an Eisner-nominated run on HELLBLAZER. He has also written Cage and Banner for Marvel Comics. With artist Lee Bermejo, he wrote the acclaimed graphic novels JOKER and LUTHOR. He helped inaugurate the Vertigo Crime line with the graphic novel FILTHY RICH. Vertigo. Hardcover. 1401238076 Please allow 4 - 14 business days for Standard shipping, within the US. Thank you for supporting our small, family-owned business! . Fine. 2013-04-16. Deluxe. Vertigo. Hardcover. 1401238076 Please allow 4 - 14 business days for Standard shipping, within the US. Thank you for supporting our small, family-owned business! . Fair. 2013-04-16. Deluxe. Vertigo. Hardcover. 1401238076 Please allow 4 - 14 business days for Standard shipping, within the US. Thank you for supporting our small, family-owned business! . New. 2013-04-16. Deluxe. Vertigo. Hardcover. 1401233724 New Condition. . New. Vertigo. Hardcover. 1401233724 Like New Condition. . Fine. New York: DC Comics, 2012. unpaginated; HB blk.emboss; fine condition w/clean,tight pgs. DJ white w/blk.&red-pic.cover; fine. "Originally published in single magazine form in 100 Bullets 20-36". Deluxe. Hard Cover. As New/As New. Illus. by Risso, Eduardo. 4to - over 9¾" - 12" tall. Vertigo. Hardcover. 1401233724 Please allow 4 - 14 business days for Standard shipping, within the US. Thank you for supporting our small, family-owned business! . Fine. 2012-04-17. Deluxe. Vertigo. Hardcover. 1401233724 Please allow 4 - 14 business days for Standard shipping, within the US. Thank you for supporting our small, family-owned business! . New. 2012-04-17. Deluxe. 2014-02-01. New. Ships with Tracking Number! INTERNATIONAL WORLDWIDE Shipping available. Buy with confidence, excellent customer service! 2009-08-28. Good. Ships with Tracking Number! INTERNATIONAL WORLDWIDE Shipping available. May not contain Access Codes or Supplements. May be ex-library. Shipping & Handling by region. Buy with confidence, excellent customer service! 2001-04-20. Good. Ships with Tracking Number! INTERNATIONAL WORLDWIDE Shipping available. May not contain Access Codes or Supplements. May be ex-library. Shipping & Handling by region. Buy with confidence, excellent customer service! New York: DC Comics, 2011. unpaginated; HB blk.emboss; fine condition w/clean,tight pgs. DJ white w/blk.&red-pic.cover; fine. 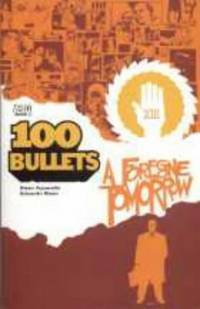 "Originally published in single magazine form in 100 Bullets 1-19". Deluxe. Hard Cover. As New/As New. Illus. by Risso, Eduardo. 4to - over 9¾" - 12" tall. Vertigo. Hardcover. 1401233724 Please allow 4 - 14 business days for Standard shipping, within the US. Thank you for supporting our small, family-owned business! . Fair. 2012-04-17. Deluxe. VERTIGO. Paperback. 1845762525 Please allow 4 - 14 business days for Standard shipping, within the US. Thank you for supporting our small, family-owned business! . New. 2006-01-01. VERTIGO. Paperback. 1845762525 Please allow 4 - 14 business days for Standard shipping, within the US. Thank you for supporting our small, family-owned business! . Fine. 2006-01-01. VERTIGO. Paperback. 1845762525 Please allow 4 - 14 business days for Standard shipping, within the US. Thank you for supporting our small, family-owned business! . Fair. 2006-01-01. Vertigo, 2013. First edition. Hardcover. Fine/fine. Eduardo Risso. As new copy with no flaws, bright and tight. Stated first printing. Unclipped DJ protected with new mylar cover. 4to, bookseller #003272. DC Comics, 2012. Hardcover. Good. Disclaimer:A copy that has been read, but remains in clean condition. All pages are intact, and the cover is intact. The spine may show signs of wear. Pages can include limited notes and highlighting, and the copy can include previous owner inscriptions. An ex-library book and may have standard library stamps and/or stickers. At ThriftBooks, our motto is: Read More, Spend Less.Dust jacket quality is not guaranteed. Vertigo. Paperback. 1401245064 Please allow 4 - 14 business days for Standard shipping, within the US. Thank you for supporting our small, family-owned business! . Fine. 2014-04-15. Vertigo. Paperback. 1401245064 Please allow 4 - 14 business days for Standard shipping, within the US. Thank you for supporting our small, family-owned business! . New. 2014-04-15. 2014-02-01. Good. Ships with Tracking Number! INTERNATIONAL WORLDWIDE Shipping available. May not contain Access Codes or Supplements. May be ex-library. Shipping & Handling by region. Buy with confidence, excellent customer service! VERTIGO. GOOD AUTHOR SIGNED. LARGE PAPERBACK. signed by Azzarello on the half title page book nice and c lean and tight. .
Vertigo. Paperback. 1401245064 Please allow 4 - 14 business days for Standard shipping, within the US. Thank you for supporting our small, family-owned business! . Fair. 2014-04-15. New York, NY, U.S.A.: Vertigo, 2014. First Trade Paperback Edition. Trade Paperback. NEW. Risso, Eduardo (illustrator); Goleash, Grant (illustrator). Brief summary of content available upon request by e-mail. NEW YORK, USA: VERTIGO(DC COMICS). GRAPHIC NOVEL(TRADE PAPERBACK). COLOUR COMIC STRIP ART. BOOK 5 OF THE SERIES. COLLECTS ISSUES 31-36 OF THE COMIC SERIES. LOCATION: TBS1 . Fine. Soft cover. 2003. NY: Vertigo/ DC Comics. Fine. 2000. 1st Printing. Trade Paperback. Stated First Printing. Trade paperback in fine, unread condition. Repr ints 100 Bullets 1-5 and Vertigo: Winter's Edge 3. Art by Eduardo Riss o. Covers by Dave Johnson. .
Vertigo. PAPERBACK. 1401245064 *BRAND NEW* Ships Same Day or Next! . New. Vertigo. PAPERBACK. 1401245064 *LIKE NEW* Ships Same Day or Next! . Fine. TITAN GRAPHIC NOVELS. Paperback. POOR. Noticeably used book. Heavy wear to cover. Pages contain marginal notes, underlining, and or highlighting. Possible ex library copy, with all the markings/stickers of that library. Accessories such as CD, codes, toys, and dust jackets may not be included. Vertigo. Used - Good. Former Library book. Shows some signs of wear, and may have some markings on the inside. Dc Comics. Used - Good. Ships from the UK. Former Library book. Shows some signs of wear, and may have some markings on the inside. 100% Money Back Guarantee. Your purchase also supports literacy charities. New York, New York: Vertigo, 2003. Softcover. Very Good/No Jacket. Used Graphic Novel: Trade Paperback Standard used condition. Reading copy or better. New York, New York: Vertigo, 2004. Softcover. Very Good/No Jacket. Used Graphic Novel: Trade Paperback Standard used condition. Reading copy or better. Vertigo, 2003. Please email us if you would like further information or if you would like us to send you a picture of the book. Thanks for looking! . First Edition. Soft Cover. Very Good +. Illus. by Eduardo Risso . 4to - over 9¾" - 12" tall. Vertigo, 2014 Soft cover. New. DC. Used - Good. Good condition. DC Comics, 2015. Paperback. Good. Disclaimer:A copy that has been read, but remains in clean condition. All pages are intact, and the cover is intact. The spine may show signs of wear. Pages can include limited notes and highlighting, and the copy can include previous owner inscriptions. An ex-library book and may have standard library stamps and/or stickers. At ThriftBooks, our motto is: Read More, Spend Less.Dust jacket quality is not guaranteed. TITAN GRAPHIC NOVELS. Used - Good. Ships from the UK. Former Library book. Shows some signs of wear, and may have some markings on the inside. 100% Money Back Guarantee. Your purchase also supports literacy charities. TITAN GRAPHIC NOVELS. Used - Very Good. Ships from the UK. Former Library book. Great condition for a used book! Minimal wear. 100% Money Back Guarantee. Your purchase also supports literacy charities. New York, New York: Vertigo, 2000. Later Printing. Softcover. Very Good/No Jacket. Used Graphic Novel: Trade Paperback Standard used condition. Reading copy or better. New York, New York: Vertigo, 2000. Softcover. Very Good/No Jacket. Used Graphic Novel: Trade Paperback Standard used condition. Reading copy or better. Titan Books Ltd, 08/23/2002. Paperback. Used; Good. **WE SHIP WITHIN 24 HRS FROM LONDON, UK, 98% OF OUR ORDERS ARE RECEIVED WITHIN 7-10 DAYS. We believe you will be completely satisfied with our quick and reliable service. All orders are dispatched as swiftly as possible! Buy with confidence! Titan Books Ltd, 04/20/2001. Paperback. Used; Good. **WE SHIP WITHIN 24 HRS FROM LONDON, UK, 98% OF OUR ORDERS ARE RECEIVED WITHIN 7-10 DAYS. We believe you will be completely satisfied with our quick and reliable service. All orders are dispatched as swiftly as possible! Buy with confidence! VERTIGO. GOOD CONDITION. LARGE PAPERBACK. Trade Paperback. Veritgo 2001. Sticker Scar on Front Free Endpaper. Unless Listed in this decription, VG or Better.